Stamp 3 chicks on Whisper White. Color with Yellow marker (So Saffron or YoYo Yellow) and Orange beek. Cutout all 3 chicks. 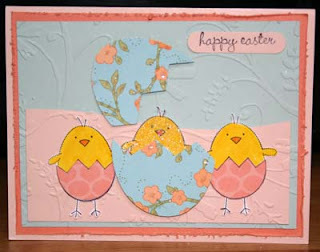 Stamp 2 chicks on Ginger Blossom DSP paper and just cut out the egg shells. Adhere the 2 egg shells to 2 of the chicks. Add glitter to the 3rd chick. For the big egg, use the Egg stamp on the Bali Breeze DSP and cut out. Then manually add your own Zig Zag for the egg to appear broken. Add desired glitter to big egg. Put glittered chick behind big egg to appear as though it is in the egg (can't see the feet or other egg shell, just the chick top). Adhere chicks to cardstock with SNAIL. Adhere the big egg using Dimensionals. Stamp 'Happy Easter' or greeting and then punch out with Window punch and adhere. The cuttlebug was used for the Blush Blossom and Sky Blue in the front. Adhere together. The Groovy Guava piece was distressed using the Cutter's Kit. Adhere to Blush Blossom cardstock.